The girls came over the other night to watch the Bachelor (go Melissa! ), so I whipped up these cupcakes from a cupcake calendar that one of the girls gave me for Christmas. Unfortunately, that particular girlfriend was sick and didn’t end up making it. When making these, I set two of them aside to send to my other girlfriend who’s birthday is today. Happy birthday T! This calendar doesn’t list a different cupcake recipe every day, as you might expect, but instead gives a basic recipe then variations the next couple of days. Personally, I like this idea. 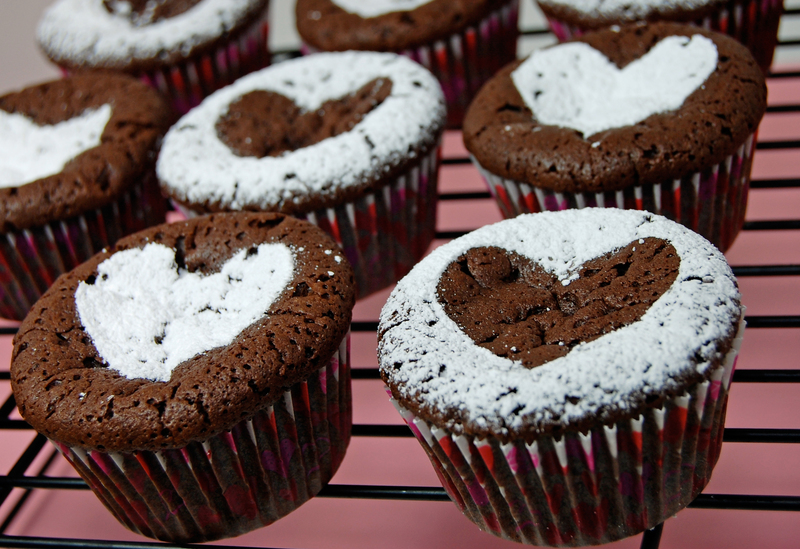 I made a few tweaks of my own, such as leaving off the frosting and topping with powdered sugar hearts, instead. 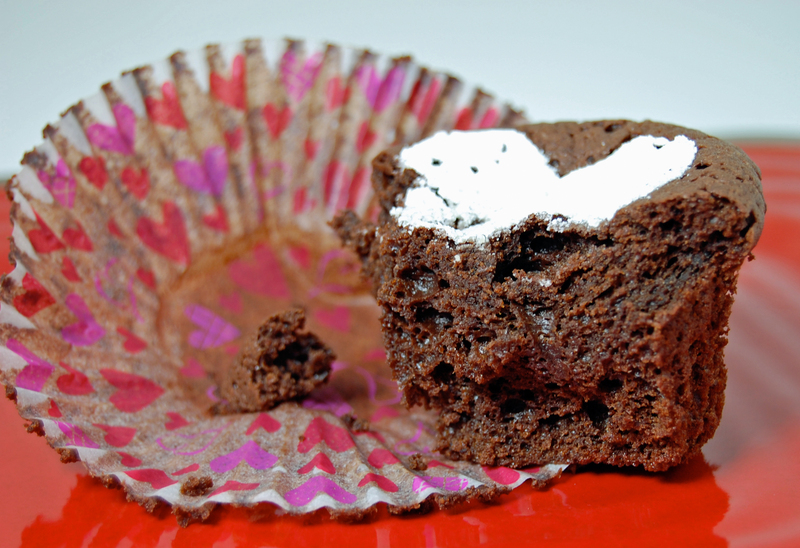 If your significant other is a chocolate lover, make these cupcakes for Valentine’s Day…they are sure to please! Preheat the oven to 375˚F. Place 12 paper baking cups in a muffin pan. Put the chocolate and butter in a double boiler, or medium bowl over a pan of simmering water, and stir until completely melted. Set aside to cool. In large bowl, cream the eggs and sugar with an electric mixer until pale and thick. Gently fold in the melted chocolate and remaining ingredients. Spoon the batter into the cups. Bake for 20 minutes. Remove pan from the oven and cool for 5 minutes. Then remove the cupcakes and cool on a rack. Bring back your elementary school craft skills and cut a heart shape out of wax paper. 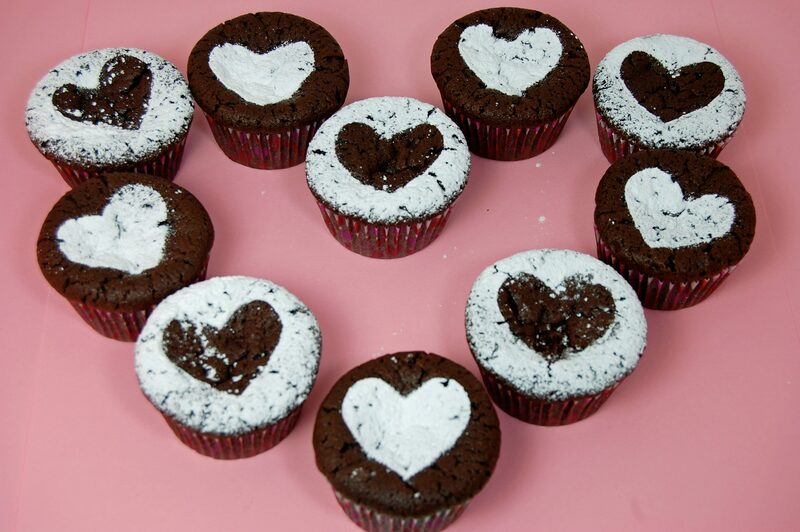 Use both the die-cut and the stencil shape to cover the cupcakes and sift the powdered sugar over top to make your heart topping. Speaking of Valentine’s Day, don’t forget to check out how you can win a RED ice cream maker from Pennies on a Platter! Penny Says: Have guests coming over last minute? Find a basic baking recipe where you have all ingredients on hand. If you are missing one minor ingredient, don’t go out and buy it, just make it without and it just may turn out better (like this cupcake recipe, I left out ground almonds)! Previous Post: « Happy 2-Year Blog Birthday Giveaway! – Time’s Up! I’m team Melissa too! I can just see in HIM that he’s fallen for her! These look yummy! Those look and sound perfect for VDay!! I love the pictures, so mouthwatering! Actually, I meant to change that in the recipe to just “butter” because I just used my regular butter, too, and knew it would probably confuse everyone by putting the “sweet butter” that the original recipe calls for. However, the butter I always use it unsalted, sweet cream butter. You probably do, too, and might not even notice. Either way, it shouldn’t matter. The important part is that when you bake, you should use unsalted butter. could you explain the egg part of this recipe a little better? I’m happy to help clarify any steps in this recipe. It is an old one, so definitely not written the best, I’m sure. 🙂 What specifically is confusing you about the eggs? Oooo, these look so good! Could I substitute Ghiradelli cocoa for the Dutch-process cocoa? Marsha, you should be able to use your Ghiradelli cocoa powder and turn out just fine. Here is a link with more information on the difference between Dutch-process and natural cocoa powder. These sound awesome and they turned out to beautifully! may i know how much almond did the original recipe called for? they look so fab! what is a cupcake calendar n where do u get it? That’s great that it worked for you. I’m getting braver about “winging it”. It’s a wonderful feeling when things work out. Btw, I saw your DIY “studio” box here & showed my Honey, so guess what he’s making for me today? 🙂 He bought me one of the Lowell EGO lights for Christmas & I love it but I’d like more of a “studio” for out in the garage. Thx, for the info on it!! I’m going to play your video for him this evening. Almost forgot thanks for stopping by my blog & commenting! Great pictures! The contrasting hearts look amazing. 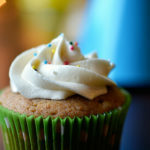 I happened upon this post because I very much need to find a chocolate cupcake to make in about a week. Turns out you and I have a lot in common. I’m watching The Bachelor tell all episode right now. 🙂 And I too was slightly disappointed to find that the cupcake calendar only changes recipes every few days. Maybe I should try the flourless cupcakes. They look really cute with the hearts on them. just to clarify, the recipe calls for 4 eggs, or 4 eggs, PLUS another 4 egg yolks? You’re not seeing double-vision. It actually does call for 4 eggs and plus another 4 egg yolks. Hope this helps! And do you add the 4 eggs yolks in with the butter and chocolate, and do 4 egg whites mixed with the sugar? then folded afterwards with the butter-chocolate-egg yolk mix? You add the 4 whole eggs plus 4 egg yolks (save their egg whites for another recipe) all at the same time with the sugar. I’m confused. After reading all the blogs and reviews, it mentions that u left out the ground almonds, but the recipe doesn’t show that ingredient ast all. For a flourless “cake” I would always put the ground almonds in. It meakes a more denser cake. What would be the amoints for adding back in the gtround almonds? When I change a recipe, I write it in my post as I made it (changes included) then link to the original source. 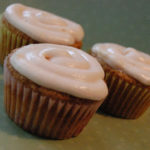 Unfortunately, the original source for this cupcake recipe is in a cupcake calendar that I no longer own, so I’m not sure how much of the ground almonds were included. I didn’t use them and the cake was very dense and perfect to my tasting. Maybe you can search the internet for a similar recipe that uses the almonds, or experiment on your own. I would start with probably a teaspoon. omfg..i m at skool rite now nd i m starving this picture juss makes me wanna eat them everyday!!!!!!!!!!!!!! Look beautiful, that’s for sure. But I was wondering what’s the texture like? I’m searching for one that’s very light and fluffy…almost like a mousse. That’s why I thought omitting flour would give me this result. I wouldn’t say that this is light and fluffy. It’s actually kind of dense but extremely delicious! Not anywhere like a mousse. I tried these but they didn’t turn out-I baked them for almost 40 minutes but they were still really soft, and it seems like all the butter settled at the bottom of the paper cups! Any idea what might have gone wrong? I’m sorry, Rebecca, but baking can sometimes be fickle and there would be no way I could tell you what went wrong. Are you at a higher elevation by any chance? Just made these tonight. Delicious! 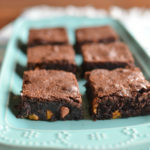 Almost like a brownie cupcake. My gluten-free, soy-free friend thanks you! They are more flat on top, not puffy. Hi, Nikki. These cupcakes tasted really good! The only thing is that they are REALLY moist in the middle. How moist are they supposed to be? A metal fork came out clean, and I had one last night and didn’t get sick, but I’m afraid to give these to other people. Thank you for the quick response! The centers are not runny, so they should be fine! I already ate three and have not felt sick, so I think they are safe. Thanks again! I made flourless cupcakes for Passover. They were incredible. I did however use a hand mixer to combine melted chic and butter withbthe egg/ sugar mixture. Also wasn’t sure when to add cocoa so added it with choc bits. I used Ghirardelli choc bits. This recipe is a keeper. Can these be made in mini muffin cups? If so, how long should they be baked for?